People who live near the coal mines in Quang Ninh have experienced some terrible suffering because of a flood. They have lost their homes and have had to move to new places. It must have been a terrible shock for them because the river that flooded was only a small, clear stream. Suddenly it became a powerful, flooding river that was dirty with things from the coal mine. CAM PHA CITY, QUANG NINH (VNS) — Wiping sweat from his forehead, 36-year-old Trinh Duc Sang took big strides along a road covered with muddy coal sludge and dirt to the place that was his home until just three weeks ago. He climbed a rickety ladder that buckled under his weight to reach his neighbour's house overlooking a creek. From there, he crossed into his old home. The 94 families in this small community are being relocated following an unprecedented landslide and flooding. Seventeen people elsewhere in the province died in the floods which caused damage estimated at more than VND2.7 trillion (US$124 million). As Sang and his friend watched, two women slowly carried large sacks over their shoulders along the stream near them. The sacks contained the last moveable possessions from their old homes. Until the floods, the stream was one metre in depth - and its waters were crystal clear. Now, the water was dirty and filled with mud and rocks. It barely reached to the women's ankles. Many houses directly in the path of the swollen stream of mud and water were washed away in just a few minutes. Others, like Sang's, were left with broken doors and half buried furniture. When the rain stopped, the mud gradually began to dry, a new ground surface at least one metre higher than before. Just around the corner from Sang's house, three children from families that still hung on to their wrecked homes, were jumping and running around in rooms half filled with rocks and soil. They could now touch the ceilings, which were formerly three metres above the floor. "Everyone was caught off guard. This type of landslide had never ever happened before," said Sang. He was able to save his most valuable assets by moving them onto the bed before fleeing with his family. Forty-one-year-old Tran Ngoc Quan in neighbouring Quang Hanh Ward had no such luck. The high water mark was still visible high on the walls of his house, in which a broken TV, a refrigerator and water-soaked bed and wardrobe were scattered around an altar to his late father. "If no one came over, I would have died I was so exhausted," Quan said. Like Sang and many others, Quan had not been prepared for anything like this. "My house sat next to a stream, so I felt assured that even if the worst flood happened, I would be safe," Quan said. "Although we carried out all anti-flooding plans approved by the authorities at the beginning of the year, this time the flooding exceeded our expectations," said Quang Hanh Coal Company's vice-chief of staff, Mai Quang Duong. The floodwater in most of the company's mines should be free of water by the end of this month, while the worst affected mines owned by the Mong Duong Company are expected to take at least two months, according to the representatives from both companies. "It should take another two or three months to recover operations," said Mong Duong Coal Co. Labour Union Chairman Tran Quang Canh. Sang knows for sure that his family will have no new-year-money bonus to celebrate the Tet holiday next year. While much of Sang's concern is about how to look after his family and whether he should move to another house closer to his sons' school, the coal companies and the local authorities had much bigger problems to worry about. Is another big rain coming this year? Will the soil dump above Sang's old neighbour-hood, or any other dumps, be made safe in time? "We have been carrying out advanced measures to prevent bigger flooding, but another big rain and our mines will be doomed," said Mong Duong company chief of staff Vu Ngoc Xuan. In July 2006, thousands of cubic metres of soil were washed down the residential area No 12 in Cam Pha's Cua Ong Ward. There were no casualties reported, but six of the15 houses in the community were destroyed. In the dozen or so mines around Cam Pha City, about 70 million of cubic metres of waste soil is dumped each year. Many other dumps, such as those at Nam Deo Nai, Nam Lo Phong, Nui Beo and Ha Tu, are expanding closer and closer to residential areas, posing a real danger to the people's lives should the rain bucket down again. "We are particularly concerned about the landslide risks in Quang Ninh," said Agriculture and Rural Development Deputy Minister Hoang Van Thang. "Provincial authorities should look into the issue now." The coal industry is said to be the backbone of Quang Ninh's economic development, accounting for about 45 per cent, or more than VND60 trillion ($2.7 billion) of the provincial budget in the last five year. The expansion of the industry brought about the development of the province, but it seems that there is now a price pay. Cam Pha City is exposed to Ha Long Bay on one side and to the open-cut coal mines on the other. According to Xuan, this means there are no other places to dump the mining waste. Wiping sweat from his forehead, 36-year-old Trinh Duc Sang took big strides along a road covered with muddy coal sludge and dirt to the place that was his home until just three weeks ago. Your forehead is the part of your head between your eyes and your hair. Sludge is mud made from things that come out of mines and factories, as well as soil and water. He climbed a rickety ladder that buckled under his weight to reach his neighbour's house overlooking a creek. A rickety ladder is one that is almost broken. If a ladder buckled, it collapsed. A creek is a stream. Both he and his friend were aware that everyone living beside the creek in Mong Duong ward would have to move out. To be aware of something means to know about it. When families are relocated they are moved from their homes to new homes. Unprecedented landslide and flooding means landslides and flooding like never before. The sacks contained the last moveable possessions from their old homes. Possessions are things that you own. The mountain of soil and rocks from the open-cut coal mine could be seen in the distance. It sides had been ominously etched with deep gutters carved deeply into its flanks by the torrential rain. An open-cut mine is one where a huge pit, rather than a tunnel is dug into the ground and minerals are picked up from the surface of this huge pit. Ominously etched means carved in such a way that it could be dangerous. Torrential rains happen when the rain pours down very heavily. Although Sang also wanted to bring his possessions to his newly rented house, kindly paid for by local authorities, he could not afford to do so. A rented house is one which the people who live in, pay money every month to the owner. Just around the corner from Sang's house, three children from families that still hung on to their wrecked homes, were jumping and running around in rooms half filled with rocks and soil. Wrecked homes are damaged homes. They could now touch the ceilings, which were formerly three metres above the floor. Ceilings that were formerly three metres above the floor were once that distance from the floor. To be caught off guard means to be caught by surprise. He was able to save his most valuable assets by moving them onto the bed before fleeing with his family. Assets are things people own that can be sold and turned into cash. The high water mark was still visible high on the walls of his house, in which a broken TV, a refrigerator and water-soaked bed and wardrobe were scattered around an altar to his late father. A high water mark is a mark left by water when it was at its highest level. Something that is visible can be seen. Once his most valuable assets, he bought them with a loan from the local bank. A loan from the bank means money lent to you by the bank. Debt is money that people owe to other people. "My house sat next to a stream, so I felt assured that even if the worst flood happened, I would be safe," Quan said. To be assured means to be made to feel certain about something. 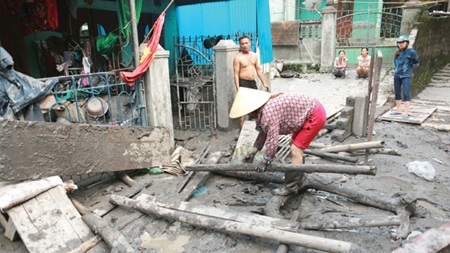 All of the traditional coal mines in Cam Pha City, particularly in Quang Hanh and Mong Duong Wards, were severely flooded. Traditional coal mines are coal mines that are mined the old-fashioned way. Their operations are still paralysed three weeks after the devastating event. If operations are paralysed, they are at a standstill and nothing is moving. A devastating event is a tragic and awful event. If the flooding exceeded the company's expectations, they were worse than the company had expected them to be. Sang was one of nearly 1,000 mine workers at the Mong Duong company who temporarily lost their jobs due to the flooding. Sang knows for sure that his family will have no new-year-money bonus to celebrate the Tet holiday next year. A bonus to your salary is something extra. Advanced measures are very big plans. If the mines are doomed, they have no future. The landslide that occurred on the artificial mountain built up by Cao Son and Coc Sau open-cut coal mines was the biggest disaster since the mines opened 40 years ago. An artificial mountain is a mountain made by humans. Such mountains are often found around mines because soil and rock that are dug up in the search for minerals are often thrown on to a pile that becomes like a mountain. There were no casualties reported, but six of the15 houses in the community were destroyed. Casualties are deaths and injuries. If residents are shifted permanently it means they will have to leave forever. The coal industry is said to be the backbone of Quang Ninh's economic development, accounting for about 45 per cent, or more than VND60 trillion ($2.7 billion) of the provincial budget in the last five year. If the coal industry is the backbone of Quang Ninh's economic development, it means that other businesses there exist because the coal industry is there. In other words, money that people earn from the coal mines is spent on other things and in other businesses in Quang Ninh. 1. The bank lent Tran Ngoc Quan money to buy animals. 2. Trinh Duc Sang owned the house he lived in and also charged other people rent to live there. 3. The floodwater in most of the Mong Duong company's mines should be free of water by the end of this month. 4. Hoang Van Thang is the Deputy Minister of Agriculture and Rural Development. 5. The Quang Hanh Coal Company had thought that the flooding would have been far worse than it was.